Because chimneypieces are one of the most architecturally important decorative elements in a room, but also easily removed, they are often replaced during major renovations. The ca. 1812 Drawing Room followed this pattern and in ca. 1882 a Victorian-era marble chimneypiece was installed in the room during an Aesthetic Movement renovation of Montpelier’s interior. Because the Drawing Room's ca. 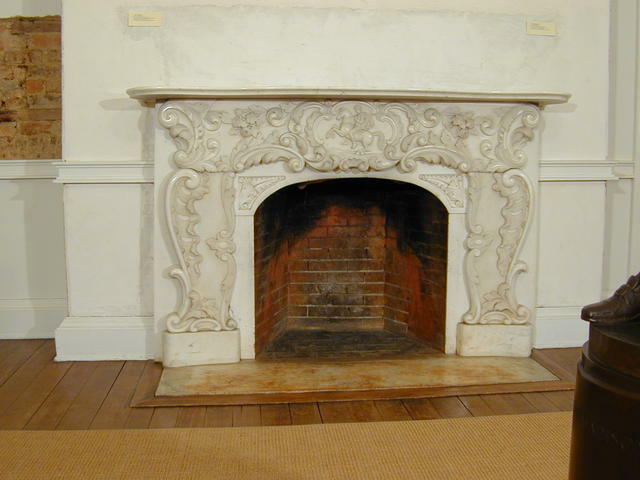 1812 chimneypiece was such an important architectural feature, the Restoration Team wanted to make sure they recreated the element as accurately as possible. Fortunately, their work was made much easier by the incredible amount of surviving evidence uncovered during the restoration. The ca. 1882 marble chimneypiece in the Drawing Room.